WIND Wireless Intelligent Networked Device is a wearable robot controller developed by Future Robotics Technology Center (fuRo), a division of the Chiba Institute of Technology. 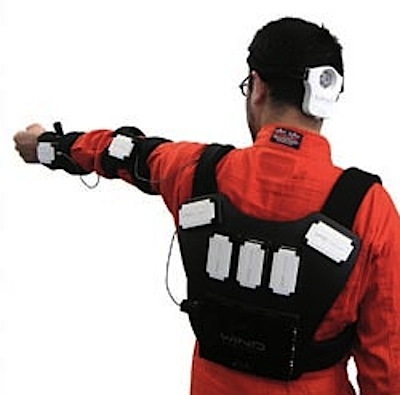 The device, which is essentially a sensor-festooned vest, translates your movements into robotic ones. Whereas robots have conventionally been controlled through the operation of computer mice and keyboards, the WIND (Wireless Intelligent Networked Device) permits robot control with the use of a SiP (System in Package) chip, packing the full functionality of a personal computer onto a single semiconductor. The WIND operates a robot by detecting and recognizing human movement and performing wireless transmissions of operation instructions to a robot. Watch this video, and see a robot (fuRo’s small humanoid Morph 3) carefully mimic the movements of the model. This device is kind of like a full-torso waldo, as described by Robert Heinlein in his 1942 novella of the same name. I'm sure readers can think of recent examples that are closer.